I often times find myself encouraging clients to push through an initial emotion or sense of doubt or lack of belief in something… It seems all too common that we go through life holding back, stuck in indecision and even completely disabled in creating the life that we actually want to be living. I often get caught up on how to help someone push past whatever is holding them back, in order to find their own sense of purpose or fulfillment. I often turn to my own experience or cling to a shroud of research or statistics that help build my argument for grabbing ahold of a strength rather than getting trapped by weaknesses or regrets. I have learned that I can give a mighty pep talk and maybe even leave a client feeling empowered and energized when they walk out of my office space… but a week later when they return, I am met with fizzled excitement, a new sense of self-doubt and a plethora of reasons for why change was not possible this week. There is something to be said for needing to find your own belief within… for it to truly move you to change. So how do we break out of our negative patterns of behavior and get out of our own way, allowing ourselves to forge a new path, and perhaps find the strength we were looking for, within, where it was all the time? I am convinced that this process is one more similar to the tortoise than it is to the hare. I don’t fully understand why we all want to be the hare and literally race through the seasons of our life and feel continually let down by our own selves when we don’t act or accomplish what we had hoped in the short amount of time we gave ourselves. 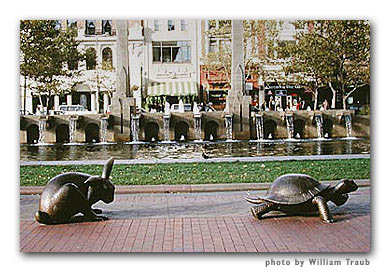 If it were actually possible to give yourself permission to be the tortoise, to slow down, to be more contemplative and possibly more intentional about our actions, and allow ourselves the grace to do this without the self or other imposed pressure to be something or someone we really are not ready to be, or perhaps even meant to be…. Imagine what we might be able to do with our lives! I say this a lot in my office, and am often met with rolling of eyes, but I truly believe that the process of change begins with small baby steps. They need not be giant or monumental or earth shattering, or mind blowing as we often build up in our mind making it nearly impossible to succeed or even remotely reach the bar. Sometimes they are small, and small does not mean insignificant. So take a small step. Dig deep. That is my challenge to myself and to you. That we would choose to dig deep within, and find the strength that was there all the time, even if hidden underneath a lot of doubt or grief or cynicism or fatigue… Tap into that strength and take a small step, whatever that looks like to you.